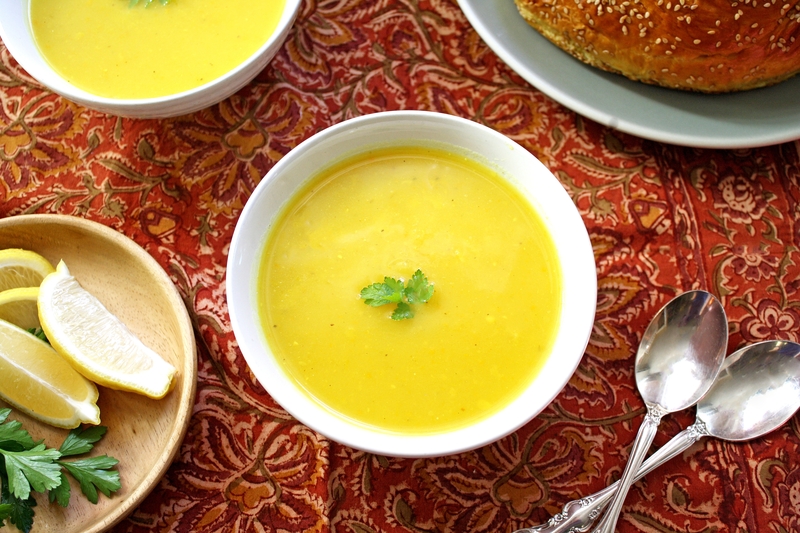 A comforting Shabbat soup from the Egyptian Jewish community. Egyptian Jews comprise one of the oldest Jewish communities in the world. There have been waves of Jewish immigration to Egypt over centuries: Sephardic Jews arrived during the Spanish inquisition, Ashkenazi Jews fled there from Eastern Europe during the pogroms of the 19th century, and Jewish traders from the Ottoman Empire settled after the opening of the Suez canal in 1869. In the 1950s, Egypt began to expel Jews from the country after the creation of the State of Israel. Like many stories of diasporic cuisine, Egyptian Jews brought their dishes with them to new places. In middle school, one of my good friends was the daughter of an Egyptian Jew. I remember the first time going to her house and smelling the incredible smells coming out of their kitchen. Everything was new to me — their food was made with spices I had never even heard of. It sparked a lifelong interest in Egyptian Jewish food with its North African, Middle Eastern, and European influences. Spices like turmeric, coriander, fenugreek, and cardamom are all common in Egyptian cooking, and there are dishes of stuffed vegetables, vibrant salads, and beautiful soups and stews. I came across an Egyptian Jewish recipe that jumped out at me in Copeland Marks’ book, Sephardic Cooking. Bata Bel Lamoun (Golden Potato Soup) is a soup that the Egyptian Jewish community commonly prepared for Shabbat. 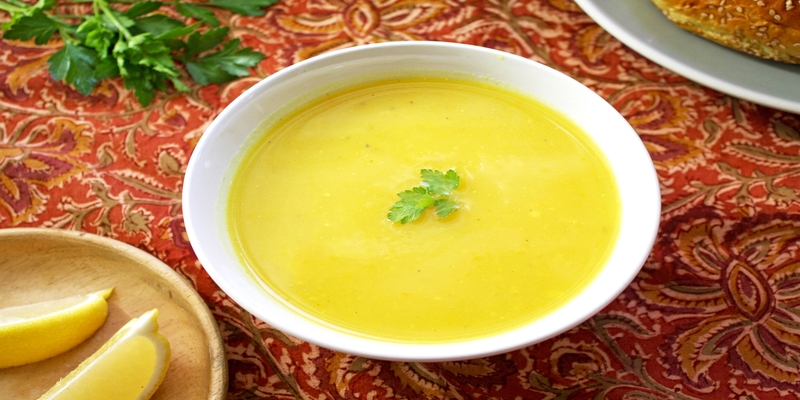 I have found only a few other recorded recipes for this soup, but each one includes a small list of simple everyday ingredients: potatoes as the base, turmeric for its golden color, and aromatics like onion, celery, and garlic. 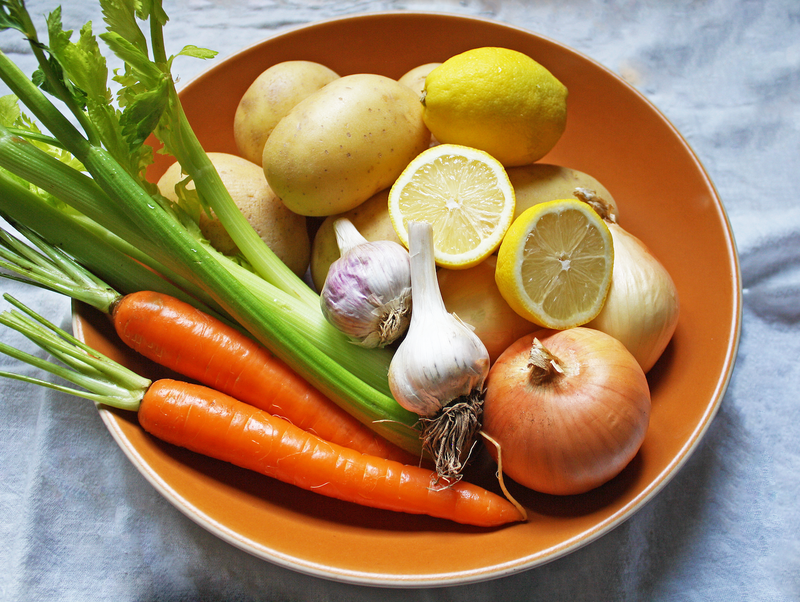 The most surprising part of the soup comes from fresh lemon juice that is added at the end. The soup becomes even sunnier, the acidity and freshness complement the creaminess of the potatoes and make the turmeric-stained golden color seem even. Some of the recipes call for chicken stock as the base of the soup, but it is easy and delicious to make this with just water for a vegan/vegetarian version. These simple ingredients simmered together result in something much greater than their individual parts. Batata Bel Lamoun is a golden silky soup, filling without being too rich, full of flavor and deeply aromatic, and it’s a great dish for a cold night after a long week. 1. Add a few tablespoons of olive oil to a large pot over medium heat. Add the chopped onion, celery, and carrot to the pot. Sauté until very softened and the onions are completely translucent and starting to get golden, about 10-12 minutes. 2. Add the minced garlic, and sauté for an additional 2-3 minutes, or until the garlic is softened and fragrant but not beginning to brown. Add the turmeric and a generous amount of salt and pepper, and sauté for an additional minute or until all of the vegetables are well coated in the spice. 3. Add the peeled and cubed potatoes, and the water/stock to the pot (if using water, you can also add a vegetarian bouillon cube for added flavor). Bring the liquid up to a simmer, then lower the heat and simmer for 30-40 minutes or until the potatoes are tender and fully cooked. Remove the soup from the heat. For a smooth soup, use an immersion blender or blender at this point and purée the soup. 4. Off the heat, add the lemon juice, stir and taste. Add more lemon juice, salt, and/or pepper to your liking. Soup can be made in advance and freezes well. With rice, noodles AND matza balls, this soup is a carb fest -- and it's glorious.